The ability to categorize objects or experiences as “the same” or “different” has generally been considered a relatively advanced cognitive capacity relegated solely to vertebrates (or perhaps even primates). However, in a study published in 2001, researchers found that honeybees are able to conceive of sameness and difference, showing that the capacity to make these abstract conceptual distinctions is more widespread than we had believed. The researchers used a stimulus-matching experiment in order to test the ability of honeybees (Apis mellifera) to distinguish same from different. Individual bees were introduced into a Y-shaped maze with a particular cue at the entrance; in order to reach the reward, the bee had to follow the fork with the same cue. For example, if the bee saw a yellow patch at the entrance, it would have to go down the arm with a yellow patch (instead of a blue one) to get the sugar reward. There were several pairs of cues: blue vs. yellow colour; vertical vs. horizontal grating; radial vs. linear patterns; and lemon vs. mango scents. The bees were initially trained with one pair of cues; over time, they showed improvement in their performance, which means they were learning that the reward was at the end of the arm which matched the cue at the entrance. Since it’s possible that they had simply learned the correct response for different experimental setups, the researchers required the bees to successfully transfer their learned behaviour to a new set of cues in order to demonstrate a general conception of “sameness”. 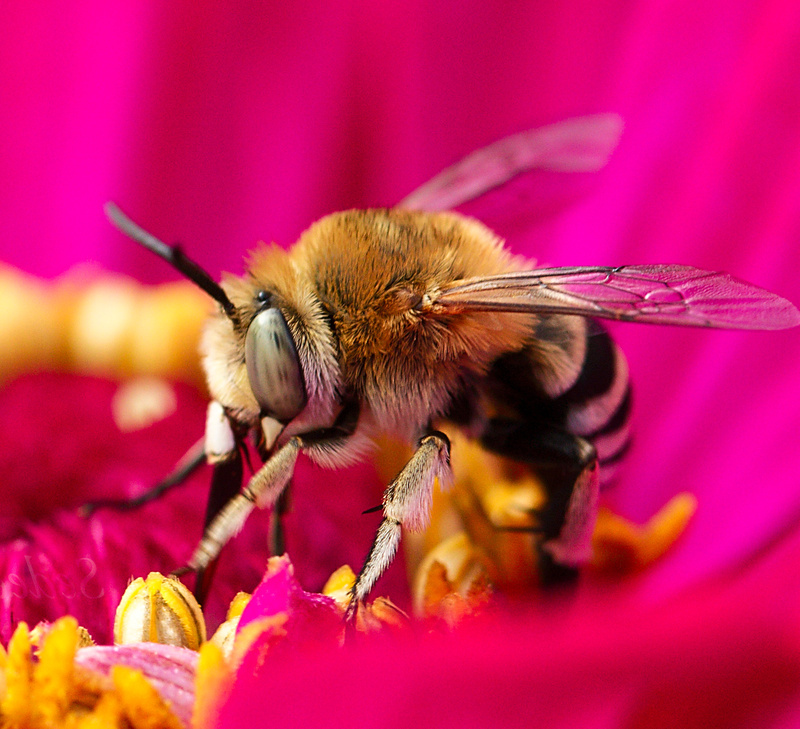 For example, bees which had learned to match colours were tested with horizontal vs. vertical gratings. If the bees really had learned that they should follow the same cue that was at the entrance, they should have been able to generalize that to a new type of cue. On the other hand, if they had simply memorized the correct response for different configurations, they would have to learn the correct response from scratch again. The researchers found that the bees were consistently able to successfully transfer their learning to new pairs of cues. Bees trained to match colours in order to find a reward were able to generalize this behaviour to other visual cues, such as patterns; in fact, they even generalized the concept of “sameness” to a different sensory modality — bees which were trained to match odours proved able to also match colours. The researchers also conducted the same experiment with the reward being at the end of the arm with the different (non-matching) cue; again, bees were able to learn to distinguish between the first pair of cues and were able to transfer that knowledge (“pick the different stimulus”) to a new set of cues, although in this case the researchers only checked visual cues. These experiments show that bees are able to not only learn to distinguish between cues, but to transfer this knowledge to new cues which weren’t part of the training. Bees are capable of conceptualizing the categories of sameness and difference and classifying their experiences accordingly; they are able to do this between different aspects of a particular sense (colour vs. pattern) and also between different kinds of senses (visual vs. olfactory). As with the case of ravens which point, we see that “advanced” cognitive abilities which we’ve previously considered restricted to humans (or primates or vertebrates) can be found in very different species with a relatively simple nervous system challenging our hierarchical conception of our place in the world. This sort of research always fascinates me because it seems to me to touch upon a crucially important question in our conceptual framework: how do we determine what kind of mind/consciousness (if any) other organisms/entities have? Our default approach seems to be to rank other creatures according to their similarity to us. When I’ve challenged this position, people have sometimes tried to defend it by pointing out our relatively complex nervous systems. These results highlight how little we really know about the connection between mental faculties and nervous systems, emphasizing the prima facie nature of this sort of reasoning and demonstrating the risk of relying on it. I’m not quite sure exactly what “reasoning” is or how to tell when a creature is doing it, but there seems to be at least a hint of it in the bees’ ability to generalize what they had learned to novel circumstances. We still have a long way to go in trying to understand the origin and nature of that elusive thing we call “mind”.